Engaged online communities have become marketers’ Holy Grail. The pendulum has swung swiftly towards consumers, who can now easily access content virtually anywhere, anyhow at anytime. I don’t need to tell you we’ve reached a mind-blowing state of competition for your most precious asset: your time. And that’s just online. Getting you physically in the door of a brick-and-mortar building? The bar is seemingly set at Olympic pole vault-level heights. My colleague, Carol Summerfield, wrote how the museum industry may be the business category that’s mostly woefully behind the curve of engaging consumers digitally. Interestingly, there is one museum that is a shining example of authentic community-building that has raced to the head of the pack: the Petersen Automotive Museum in Los Angeles. When Adam Langsbard first took on his current role as Petersen’s chief marketing officer, he faced a unique challenge: For well over a year, the museum would be closed for a massive, $125 million renovation. So, he was forced to get creative quickly. What Langsbard did next is something I’ve been sharing with potential museum clients ever since I heard about it. 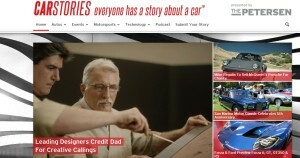 He created CarStories.com, an online community that anyone can “get” as soon as they hear the name. The tagline — “everyone has a story about a car” — is so simple it makes you smirk in appreciation. He describes it as a mash-up between user-submitted stories, social media updates, news and Petersen-specific content. None of this is done in a “Look at us!” kind of way, but instead offers unique points of view and emotionally engaging narratives. Langsbard surveyed the highly saturated automotive media marketplace and found the white space. While other entities promote technical know-how, engineering specs or collectibles, Langsbard went for the emotional jugular, tapping into the role that cars play in people’s lives — while, as he says, staying “museum-like.” They chose their lane wisely. It’s the nuance of the online community that really stands out. While it is owned and operated by Petersen, the site positions the organization as the “presenting sponsor.” It’s user- and community-focused, not Petersen-focused. This is at the heart of what it means to authentically engage an audience. It’s a delicate balance of leveraging content built off of the nearly 300 cars Petersen has in its collection to create a dialogue and draw people in without coming across as promotional. I was so inspired by Adam’s work, I flew to Los Angeles to meet with him. The building is stripped down to its studs, and more than a hundred workers literally pounded away as we talked in his basement office. (Despite those distractions, we managed to have a productive conversation. CarStories is positioned as an online exhibit, but with a few months to go before the museum reopens, the online community continues to grow at a rapid pace. Petersen’s social following is impressive — 56,000 Facebook fans, 27,000 Instagram followers and nearly 10,000 Twitter followers — almost all organically. More importantly, the content is getting solid and steady social sharing, expanding the marketing channel Langsbard is most impressed by: brand ambassadors. And the Petersen crew is quickly realizing they have an opportunity to be brand journalists. They can provide a voice at various car-related events, and collect a number of story angles at those same events. And they have several other unique ways to connect with relevant organizations in the space to boost their brand perception. Storytelling, according to Langsbard, is at the heart of what museums do. “We’ve evolved from cavemen drawings to steel structures, but at the heart of it, telling stories is what we do as a museum,” he said. Today, the focal point of that evolution is online, but few have done it in such a progressive way as Petersen. I believe online communities are the biggest untapped marketing tool for museums. Considering there are more museums “than there are Starbucks and McDonald’s combined” in the U.S., if you’re not asking yourself how to create value for members virtually and build up a marketing base digitally, you’re going to get left in the dust by the competition. 1. Go Beyond the “Feet in Door” Mindset: Langsbard was forced to find a new front door, and in hindsight it was a blessing. Improving foot traffic to your museum is only one avenue to educate and inform. There are many who may never visit your physical location, but can still find something worthwhile in your subject-matter expertise, point of view and content. In fact, that’s mental exercise you can use to get started: How can we appeal to people who may never visit us in person? 2. Leverage Your Gravitas to Own a Content Niche: The Petersen surveyed the market, looking at Motor Trend, Car and Driver and other media entities, and identified a gap in the automotive sector they could own. The rich history of Petersen enabled them to stick a flag in the ground and focus on car stories. 3. 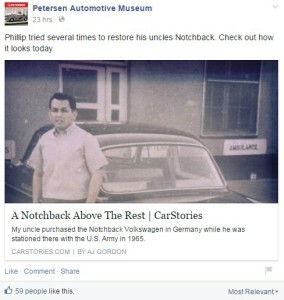 Drive the Online Community, but Don’t Put Your Organization Front and Center: I can’t reinforce enough how the nuance of Petersen being the “presenting sponsor” instead of plastering their name and brand all over CarStories.com makes a difference. Rather than force a predetermined message down their audience’s throats, they are doing car lovers a favor by curating content, creating original stories and news updates, and providing a platform for fans to voice their views. Your organization’s point of view and the editorial and curation skills it has are a huge advantage in the war for people’s attention. Use it. Leverage it. And, take the content to the target market to invite them into the conversation. 4. Think Like a Media Publisher: Museums do this to a small extent already, but it’s mostly been limited to annual reports, collateral mailing materials and a website (which in most cases is just an online version of their brochure). To capture and hold a public audience, you need to commit substantial time and resources, develop fine-tuned processes for finding and telling great stories through multiple forms of media, and take a long view of achieving success. But the payoff is worth it: For evidence, look no further than Langsbard, who plans to keep CarStories.com running long after the Peterson museum reopens later this year. In fact, he lit up when talking about the future the site and expanding on the brand credibility it’s generated with other automotive media entities. 5. Gather Information While Building Interest: The beauty of engaged online communities is they provide authentic, free marketing advice. On CarStories, it’s clear to see what kinds of content resonate and get shared, and they can use that information to drive future online coverage and physical exhibits. In fact, I predict that the more successful online communities for museums will be part of the on-site exhibits. (Couldn’t you see CarStories.com as an exhibit featured digitally throughout The Petersen?) Also, by engaging people over time, you’ll make it more likely that they’ll actually make the trip to your museum, even if it’s thousands of miles away from their home. I’ll be checking in with Adam down the road — no pun intended — to learn more about how CarStories.com pays off for Petersen. In the meantime, if you’d like to share a trend, tip, insights or questions on how to merge online communities with physical spaces, I’d love to hear from you. E-mail me at Jay@TeamWorksMedia.com or follow me on Twitter @_JaySharman.